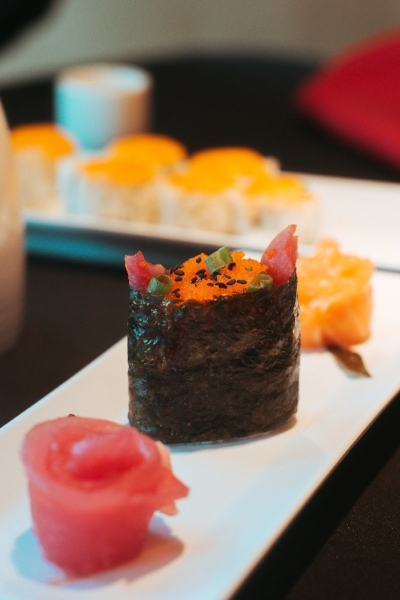 All You Can Eat sushi only $21.99 per person! Consuming raw or undercooked animal foods may increase your risk of food-borne illness. Pan-seared salmon, mild spicy cabbage slaw, green onions & cilantro / served with sweet potato fries. Pineapple-glazed grilled salmon over cranberry wild rice pilaf and asparagus topped with pineapple chutney. Slightly-seared ahi tuna over cranberry wild rice pilaf, topped with a garlic cream sauce. 1/2 lb. burger with avocado cream cheese, grilled mango & mild spicy slaw / served with sweet potato fries. 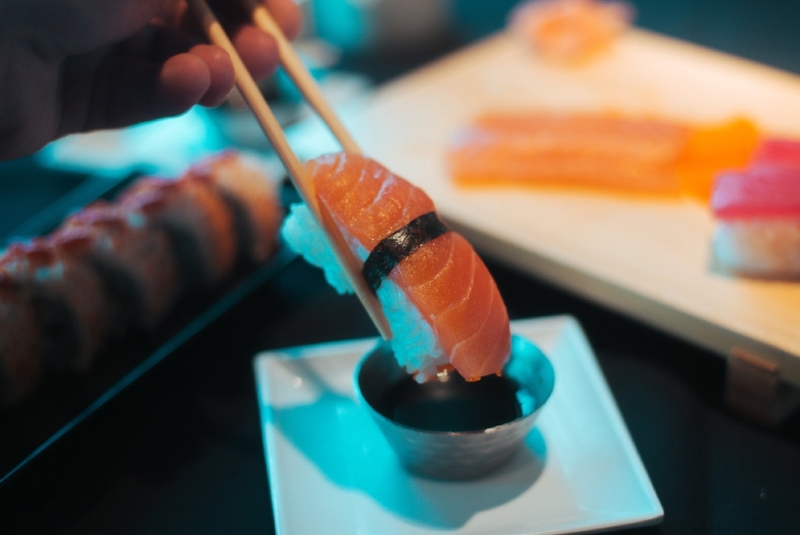 Start off your dining experience with some traditional starters like Nigiri (above) or Sashimi (right). Avocado, crunch & spicy mayo. Crab, avocado, cucumber, spicy mayo & sriracha / eel & sweet sauce. Salmon, cucumber & cream cheese. Sweet potato, cucumber, cream cheese, crunch & sweet sauce. Tuna, avocado, crunch, cilantro & spicy mayo. Tuna, daikon, crunch, eel sauce & spicy mayo. Panko chicken, cream cheese, cucumber & eel sauce. Sweet potato, avocado, mango & sesame seed. Tuna, green onion, crunch & sweet sauce. Tuna, green onion, strawberry, crunch & sweet sauce. Shrimp, cream cheese, avocado, crunch & eel sauce. Shrimp, cream cheese, cucumber, crunch, spicy mayo, eel sauce & sweet sauce. Shrimp, green onion, cream cheese & spicy mayo. Shrimp, banana, avocado, cucumber, crunch, spicy mayo & sweet sauce. Tuna, mango, jalapeño, crunch, masago, sesame seed, spicy may & sweet sauce. Shrimp, cream cheese, jalapeño, togarashi & sriracha. Crab, shrimp, apple, cream cheese, sriracha, spicy mayo & eel sauce. Salmon, green pepper, daikon, cilantro, crunch, spicy mayo & green pepper sauce. Shrimp, chicken, cream cheese, crunch, spicy mayo & sweet sauce. Tuna, jalapeño, green onion, daikon, crunch, sriracha & volcano sauce. Shrimp, avocado, toasted eel, crunch & eel sauce. Soft-shell crab, cream cheese, masago, spicy may & sriracha. Shrimp, tuna, avocado, cream cheese, cilantro, crunch, spicy mayo & masago. Soft-shell crab, avocado, cucumber, masago, spicy mayo & eel sauce. Salmon, tuna, shrimp, crab, eel, green onion, cream cheese, cucumber, masago, crunch, cilantro, sweet sauce, spicy mayo & eel sauce. Brat, cheddar cheese, crunch & hot mustard. Crab, shredded crab, cream cheese, crunch, sweet & eel sauces. Jalapeño, cucumber, cream cheese & sriracha. Chicken, jalapeño, cream cheese, crunch & honey sriracha. Shrimp, avocado, jalapeno, cream cheese, massago, crunch, cilantro & spicy mayo. Shrimp tempura, jalapeno, cream cheese, spicy mayo & sriracha. Tuna, avocado, green onion, cream cheese & eel sauce. Our signature Spider (front) and Volcano Rolls (back). One of our feature deep-fried rolls, the Spicy Shrimp Popper. Enjoy dinner for two and try our Caterpillar Roll (left) and the renowned Hidden Gem (right). Avocado, banana crunch, jalapeno, sweet mayo, & togarashi. Apple, cinnamon toast crunch, cream cheese & caramel drizzle. Strawberry, banana, peanut butter, oreo & cream cheese; rolled in crushed oreo and topped with chocolate, white chocolate, caramel & raspberry sauce. Mango, strawberry, banana, cream cheese & chocolate drizzle. Banana, oreo, peanut butter; deep-fried; topped with strawberry & chocolate. Flavors: chocolate, white chocolate, caramel & raspberry.